See how naughty, and muddy, I can be? See how attentive and cute I can be? 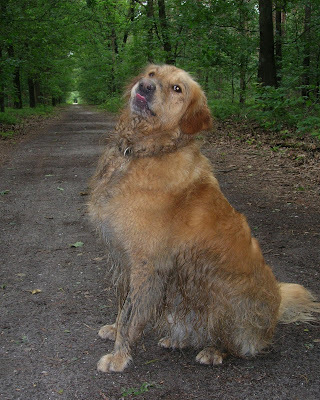 This is Tom the rescued, and apparently seriously abused, Golden Retriever out in the forest near Apeldoorn. The Reverend, who is now his ‘person’, senses Tom didn’t have a chance to play in his early life and feels it is important for him to now catch up on puppy activities. Here Tom is doing the ‘look at me’ routine before going down for more mud-fest fun. Later he cavorted in a stream and then kept out of puddles, with strong encouragement from his person! It is touching to witness the development of trust. Both dog and man need to grow the mutual trust. A nip can set the process back, but not for long. The desire to be loved overcomes the fear very quickly. I found myself having to learn dog language and dog training too. On occasion Tom would emit a low dull rumbling sound as I entered the house. On such occasions my instruction was to ignore him. By not making eye contact and talking to him I was not rewarding him. Apparently one of the hardest things for a dog is for the pack to ignore it. 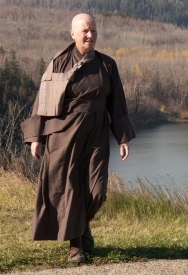 I was number two in the pack and the Reverend definitely number one, none the less matters did not go past a growl. The best pack leaders are hero’s, worthy of being looked up to. Tom definately looks up to his person, and well he might. I do too. To rule by fear does not last for long. As with dogs so with us humans. 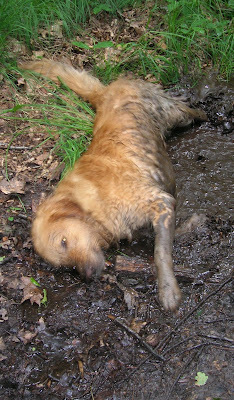 I used to love to see my dog get all muddy like that! Rolling in fox urine wasn’t too bad but when it was fox poo or worse badger or even worse duck poo I wasn’t so thrilled! I couldn’t get really cross though as he enjoyed it so much. I need to go find some mud to play in! I like your picture headings.